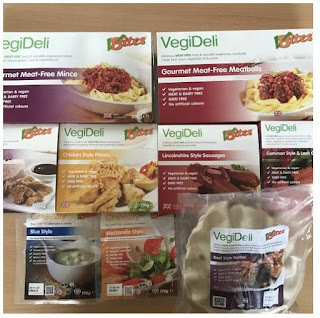 The Vegan Magpie: VBites reduced! They all have a short shelf life (but perfectly fine to get them shipped to you still in date!) however they can all be frozen. Wahey! VBites are also currently offering a lovely sounding 'winter warmer' pack for just £20.00. This includes blue style cheezly, mozzarella style cheezly, lincolnshire style sausages, chicken style pieces, beef style pieces, meat free meatballs, meat free mince, beef style pasties and a gammon style and leek quiche. Very nice! VBites have a minimum order value of £15.00 and shipping costs range from £5.50 for orders up to £49.99, £3 for orders £50.00 to £99.99 or free for orders over £100. Please do consider this when placing an order! (Also for Saturday delivery it's £10). Tesco packet cheese sauce mix! Follow Your Heart has landed! !